The Ontario PC leader's plan was blasted by Liberals. 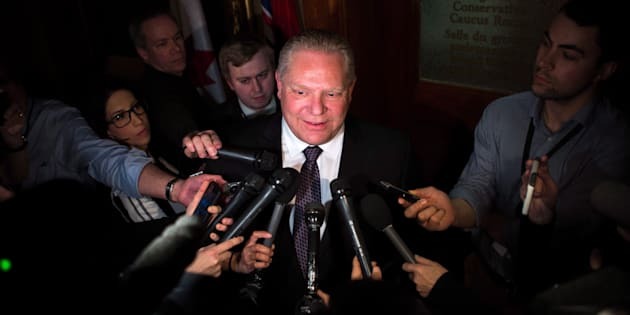 Ontario PC leader Doug Ford talks to media after a caucus meeting at Queen's Park in Toronto on March 20, 2018. TORONTO — Public backlash prompted Doug Ford to backtrack Tuesday on an election promise to allow housing development in a protected green space around the Toronto region, with the Progressive Conservative leader saying he's going to listen to those who want the area preserved. A Tory government would maintain the Greenbelt in its entirety and enshrine that pledge in the party's soon-to-be-released platform, Ford announced in a statement issued a day after saying he'd open the region to some construction to ease the housing crisis in the Greater Toronto Area. "I looked at it as making sure we have more affordable housing," Ford said of his initial position. "The people have spoken. I'm going to listen to them, they don't want me to touch the Greenbelt, we won't touch the Greenbelt." The Greenbelt — the world's largest permanently protected green space —is a 7,200-square-kilometre area that borders the Greater Golden Horseshoe region around Lake Ontario. It was protected from urban development by legislation in 2005. Ford's flip-flop came less than a week before the official start of the provincial election campaign and hours after Liberal Premier Kathleen Wynne called his Greenbelt-development pledge "wrongheaded". "If you open up the Greenbelt and make it into a Swiss cheese map you never get that back," Wynne said earlier on Tuesday. "You never get that water protection back. You never get that agricultural land protection back." Wynne had acknowledged that some areas around the border of the Greenbelt have changed since it was established over a decade ago, but that was part of the original plan for the region, she said. The premier had noted that opening up the Greenbelt for development is unnecessary. "The fact is there is enough land in the Greater Toronto and Hamilton Area to build two more cities the size of the Mississauga," she said. NDP Leader Andrea Horwath had also slammed Ford's development pledge, calling it bad policy. "There is no reason whatsoever to even contemplate paving over the Greenbelt unless you're trying to make a good buck for your friends in the development industry," she said. Ford had said Monday that for every piece of the Greenbelt opened for development, he would add equivalent land to the protected area to ensure it doesn't change in size — but he didn't explain how that would work. Those comments came after the Liberals pointed to an online video of him — apparently taken in early February when he was a Tory leadership candidate — promising to open up a "big chunk" of the protected region. Ford said that after consulting with Ontario residents, he had changed course. "I govern through the people, I don't govern through government," he said in explaining the reversal. Mitchell Kosny, associate director of Ryerson University's school of urban and regional planning, said the Greenbelt was established to control and manage growth. Opening up the area to development would slowly chip away at its integrity, he said. Development in the protected area would also move the problems of urban sprawl to the region, he said. "It means more cars, more highways, more pollution, more travel," he said. "It goes against everything I think we would now think of as, not even progressive, just mainstream planning."